In mice, targeted injections proved remarkably effective. Researchers at Stanford University have developed a compound that when injected into a tumor destroys it along with all the other cancerous masses present in the body. The combination of two agents that stimulate the immune system sparked a body-wide reaction in mice, destroying cancer cells both near and very far from the initial injection point. The success of the treatment, which worked for different types of cancer, means that human trials will be starting soon. The clinical trials will initially involve 15 patients affected by lymphoma, and the researchers, who detailed their findings in Science Translational Medicine, hope to see results as encouraging as those seen in animal models. Of the 90 mice affected by lymphoma, 87 were cancer-free after the first treatment, and the last three were rid of cancer with a second injection. When people get cancer, immune cells can recognize and attack specific proteins present in the tumors, but as the cancer grows it suppresses the immune system. Some cancers even trick it into helping rather than harming them. This surprisingly effective treatment works using the patient’s own immune cells. 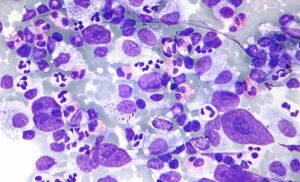 The drugs “turn on” immune cells within the tumor that had previously been put to sleep by the cancer. The drugs then amplify the ability of these immune cells so they can be much more effective in targeting and destroying the invader. Immunotherapies have been at the forefront of cancer research for a few years now. These therapies manipulate the body’s natural immune response, which has been argued to be both more effective and less aggressive than treatments such as radiation therapy. So what is so different about this solution? Other treatments, like CAR T-cell therapy, which is used for types of leukemia and lymphoma, involve removing immune cells from the patient, manipulating them, then putting them back into the body. This and other immunotherapies can have side effects, are generally expensive and only work with certain types of cancers. Although promising in mice, the researchers know that the results can change once the compound is administered to patients. Animal experiments are not always reliable indicators of how drugs or treatments might work in humans. But should the clinical trial show similar results, this could lead to targeted therapies that could complement cancer surgeries or even prevent the recurrence of tumors.